Are you one of those who are wondering “why my bounce rate is so high?”Are you looking for the right solution to reduce bounce rate? In reality, you must realise that sometimes a high bounce rate is good for your website. Now that I have your attention, continue reading to learn why. First of all, we must have a clear definition of bounce rate. A lot of people still confuse it with the exit rate, which is a totally different entity. Bounce rate is the percentage of visitors who didn’t visit any other page in the website except for the one they went in. Exit rate is the percentage of visitors who exited the site from the page. If your website is experiencing a high bounce rate, it can either be due to getting the wrong traffic to your pages; or getting the right one. I know it is confusing but let me explain. The first scenario is the most common one. The second one is when a visitor enters the site and finds what he or she is looking for. The person has no reason to stay on the website and check out the other pages. It is common for websites with all the right information to have high bounce rates, especially if it provides concise answers to questions. More often than not, visitors enter the website to find the answers and leave. They also become repeat visitors of the site. There are websites that are designed to make visitors stay and spend some time going through other pages and contents. These websites are made to convert the visitors. In this example, a high bounce rate is unwanted, and the webmaster must find the best way to reduce bounce rate. It is important to decrease the bounce rate of the pages that have the highest website traffic in order to get more engaged visitors and increase the chance of converting them. Below are ways on how to retain website visitors and reduce the bounce rate. Don’t use pop-ups. Most people are annoyed by pop-ups and find them disruptive. You might think that they are useful tools to get subscribers, but most people usually close the popup even before it loads. Provide clear navigation to contents. Visitors are more likely to click on other pages of the website if they know where to find the content they are looking for. It is important to keep the navigation of the website user-friendly in order to retain visitors. Maintain high website speed. 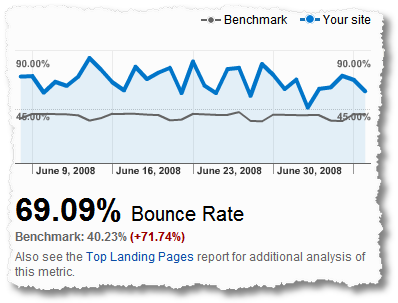 This is one factor that affects the bounce rate. Most visitors are turned off by websites that load too slow. When the website speed is too sluggish, it lowers conversion rate, damage search rankings, and limit followers reach. Website design must be compatible with all display sizes. Consumers have made the transition to mobile devices. This is why it is important to consider a website design that looks good in mobile devices as well. The information must be clear and conveys the message properly. Content must be grouped accordingly. Content is designed to be read, but it is also vital for it to be grouped into appropriate segments. Most blogs use header tags to break the text. Most visitors don’t read all the text and just scan through the article to find the answers to their questions. Avoid too much ads. Visitors don’t want to visit a site that is full of ads. It is important not have ads that are too intrusive. Google is also starting to flag pages that have too many ads. You should prioritise reducing bounce rate over impressions per page view. Use lazy loading. This is the process of loading only the objects that are needed. The rest of the content is loaded when the scroll position reaches a certain point of the page. This is important to improve website speed, as well as bolster user experience. Have an internal search engine. This will greatly reduce your bounce rate. You must also use Google Analytic to analyse internal search. It is a good way to understand what your visitors are looking for. These are some of the solutions on how to retain website visitors. You should consider these tips when trying to reduce your bounce rate.